Earlier on, I had the chance to talk about Destiny 2: Forsaken’s new Gambit mode, but that’s not the only Forsaken experience I had at E3 2018. I was also given the chance to try out the first mission of the exciting new expansion. 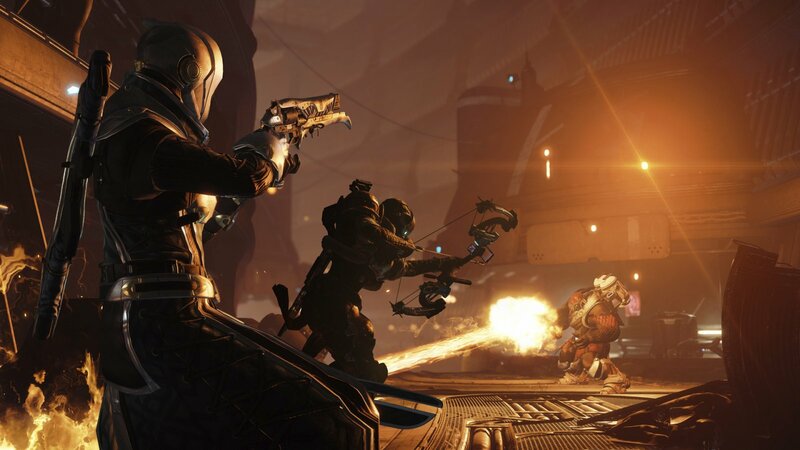 The first mission of Forsaken begins on The Reef as a prison breakout occurs at the Prison of Elders. Cayde-6 and the player, in this case me assuming the Hunter class, are tasked with investigating the incident and getting it under control. Around the prison are several escaped detainees fighting with not just the player, but with each other. This added a new layer of depth to the world, or universe, that Destiny has created. Fighting through the prison gave me a chance to check out one of the new ultimates added to the expansion. As I was playing the Hunter, I got to experience that class’s new ultimate firsthand. Called “Spectral Blades,” the ultimate allowed me to pull out dual void blades to strike down all of the enemies in my path. Other ultimates available for other classes were the Titan’s Thunderclash, which allows the player to dart through the air and crash into enemies, and the Warlock’s Well of Radiance, which was an area of effect move that heals and empowers allies nearby. This would have been more useful in Gambit, admittedly. Through each step of the first mission, Cayde-6 served as our guide, and for anyone that saw the E3 2018 trailer, each step was filled with dread. There were many situations where I felt like the mission was going to end and that a different conclusion was sure to come, but the end was delayed at every turn. It keeps players on their toes, and sets up Forsaken to be, at its core, a revenge story. The stakes are higher, and I’m sure any dedicated fan will be pissed enough to get the job done. This will be the prime motivation for the rest of the expansion, as Cayde-6 was a joy to fight alongside in the beginning of this campaign. Destiny 2: Forsaken will be released on September 4th, 2018 and is required in order to play the new mode, Gambit. For more hands-on coverage from E3 2018, keep check Gaming Trend.